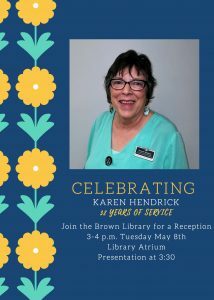 Karen Hendrick (’65), Public Services Librarian, will be retiring after 32 years of outstanding service for the ACU Library. Karen earned a B.A. in History from ACU in 1965 and an M.L.S from Texas Woman’s University in 1966. She worked at the West Islip Public Library and the Texas Tech University Southwest Collection and Water Resources Center before joining the ACU Library as Government Documents Librarian in 1986. In 1991, Karen moved to the role of Public Services Librarian, overseeing Circulation and Interlibrary Loan. Karen has mentored many students, faculty and staff over the years, especially providing many hours of instruction and research on the use of the library’s electronic databases and print collections. In recent years, Karen has devoted much of her time to curating and keeping our library print collections current and serves as our instructional liaison for many academic departments. Through the wonderful generosity of her family, the Nelson Endowment has purchased many valuable books and journals for the Library over the years and we are grateful to continue reaping the benefits of Karen’s work for many years to come.